There are several studies online about curcumin’s low bioavailability, which means that most of what we swallow goes directly into our gastrointestinal area and is expelled. Very little remains in the bloodstream about an hour or so after ingestion. However, it is possible that the small amount that does get absorbed is enough to induce apoptosis of the MM cells. Otherwise, curcumin wouldn’t have worked in my case. Curcumin is not soluble in water, but in fat. When dissolved in fat, curcumin will go directly into the lymphatic system. On the Grouppe Kurosawa website (www.grouppekurosawa.com) there is a lot of information on the bioavailability of curcumin, such as the following: The lymphatic system bathes all the cells in the body. It also bypasses the liver in what is called the first pass phenomenon. This means that more curcumin gets into the body to interact with cancer cells. Some more scientifically-minded MM listserv members have disputed this, writing that fats do not by-pass the liver. They travel from the stomach to the intestine, where they are digested, and the digestion products travel from there to the lymph, then to the blood, and then to all organs of the body, including the liver. But that’s fat. Curcumin isn’t fat. The fact remains that my Ig count decreased or remained stable on my coconut milk (fat)-curcumin powder drink. So, whatever the mechanism, some curcumin had and has to be reaching my malignant cells. For several months I mixed curcumin powder with a fat. I tried everything from coconut milk to flaxseed oil. The problem arose when I began feeling nauseous just at the smell of coconut milk heating up on the stove. That’s when I tried mixing curcumin powder with flaxseed oil. The taste was more than I could stand, but for a few weeks I managed to swallow this concoction, too. But then I joined the two main MM listservs. And began experimenting. In November of 2006, I joined the MMA Support mailing list. Later that month I joined the Acor MM listserv. I posted my curcumin experience on both lists, and began receiving dozens of private e-mails, mostly from people who wanted more information about curcumin, but some were from curcumin-takers. I learned a lot from them. Nobody mixed curcumin powder with a fat substance. I was the only one. And all had had positive results from curcumin. So I decided to test curcumin capsules with bioperine for a couple of months. I chose the same curcumin that is being used in the MD Anderson clinical trial, the C3 Complex made by the Sabinsa Corporation. I began my capsule experiment in January and expect to take my blood tests at the end of March 2007. Some curcumin-takers advised me to take curcumin capsules together with fish oil or flaxseed oil capsules. Aha, the fat needed for curcumin to be absorbed! A month or so ago, an Acor listserv subscriber posted a study called the Delano Report, which suggested that quercetin, a flavonoid found in apples, onions, red grapes, citrus fruits, broccoli and so on, would inhibit the sulfotransferase enzymes which render curcumin relatively inactive (for more information, see the Delano Report at: http://tinyurl.com/yyucfp ). As a result, I now take between 1 and 2 grams of quercetin 15 to 30 minutes before curcumin. Bioavailability update. September 10 2007 post. A blog reader recently posted a comment, with an attached abstract, on this topic, which for obvious reasons is of utmost importance and interest to me and to anybody else who takes curcumin. The abstract (http://tinyurl.com/2t73w5) reports that the bioavailability of curcumin is enhanced with HEAT. Key sentence: We report here that the water solubility of curcumin could be increased from 0.6 ÃŽÂ¼g/ml to 7.4 ÃŽÂ¼g/ml (12-fold increase) by the use of heat. A 12-fold increase in water solubility? That’s nothing to sneeze at. These researchers also found [ ] no significant heat-mediated disintegration of curcumin. Well we certainly do NOT want curcumin to disintegrate, do we? Now, I already knew that curcumin dissolves in fats (I have seen that happen with my own eyes) and I have read that it dissolves in alcohol (bring on the vodka, hic! ), but heat? And then, boom!, it hit me. When I first started taking curcumin, I mixed the powder with very warm, but not boiling, coconut milk. At that time I hadn’t even heard of bioperine nor was I taking any oil capsules. I had simply read that it was best to take curcumin powder mixed with a fat. I drank this concoction for months. And by the way, after the first eight weeks my IgG count went down almost 20 %. Consideration. As I have said before, curcumin is not water-soluble. However, recently another blog reader commented that she mixes her curcumin with heated organic whole milk. She wrote that one day she ran out of milk but managed, eventually, to dissolve her curcumin in hot water. Well, so this heating curcumin business may make sense after all. Another consideration: back in May I wrote a post on a study (http://tinyurl.com/2fh26z) that examined the degradation of curcumin when heated up. I reread it yesterday and found that curcumin was affected after being boiled in water for ten and twenty minutes. Well, no worries, then. I don’t plan to BOIL my curcumin as I do pasta, not even for a few seconds, but just heat it up enough to make it more bioavailable. And that leads to the obvious question: how much is enough ? Ok, NOW I’m in trouble! While looking for material on this topic, I came across an interesting Dutch website called Food Info Net, which is (and I quote): an independent joint project, initiated and run by Wageningen University (the Netherlands) in co-operation with several other partner universities in Europe. The site is non-commercial and all responsibility on content and lay-out is with the university partners. Hmmm, interesting. I will go back at some point and have a look at the various sections on food allergies etc. At any rate, Food Info has info on curcumin (http://tinyurl.com/ywf75z), as follows: Curcumin is light sensitive but stable at temperatures used in food processing. So, that is reassuring. It would appear that heating it up for a few seconds wouldn’t alter its properties. Or would it? My final question is: should we try taking curcumin mixed in, or simply accompanied by, a cup of hot milk? I knew I should have been a Science major. Drat. Well, the search continues. September 29 2007 post. A blog reader recently wrote me a fascinating (private) message. With his permission, I am posting parts of it (it’s a long message, so I had to edit it a bit). This is a brilliant presentation of the bioavailability of curcumin with a few interesting suggestions on how to increase it: Biocurcumax is giving us curcumin that is predissolved in 10-15% oil by weight. Isn’t that what I am doing by mixing curcumin with full fat yogurt: predissolving it before ingesting it? Could it be that those of us who predissolve in oil are already getting the benefit of the improved bioavailability that Biocurcumax wants to offer us? And why does the dissolution of curcumin in oil help the bioavailability? I believe it is because the way the body digests fat is that it the chunks go through the stomach and then it becomes emulsified when bile is added to the initial end of the small intestine. Then those small droplets of oil, containing molecules of dissolved curcumin, are small enough to pass through the vilii of the small intestine into the network of lymph ducts that parallel all the network of blood veins, into which other molecules enter through the vein pores in the walls of the vessels (but the fat droplets don’t). Fats are not digested much in the stomach or the small intestine, but enter the lymph system, along with the enzyme lipase, which breaks down the fat globules and converts the fats into glycerol and fatty acids, both of which are soluble in water. So when the lymph is dumped back into the blood vein system up near the thorax, the fat has been changed into water soluble components. Presumably, the curcumin that was dissolved in the fat globules (dissolved means that it then existed in molecular form, not crystalline form), now remains attached to the fatty acids molecules or exists as free curcumin molecules in the blood to be carried throughout the body to find their home on some ugly little cancer cell in the bone marrow, where it frightens that cancer cell into committing hara-kiri, or your favorite word APOPTOSIS. So my theory is the Biocurcumax improves bioavailability by dissolving part of the curcumin in the oil, making easier for part of it to get into the blood stream through the lymph system. But I want to dissolve ALL of the curcumin in oil so that All of it gets into the blood stream through the lymph system. Maybe we already are there and don’t know it because no one ever measured.Finally, I have two more brainstorm ideas to push on you. First, you must realize that curcumin will dissolve in alkaline aqueous solutions, but not acid solutions. The stomach is very acidic but the small intestine is very alkaline. First idea is to ferry the curcumin through the stomach, where a lot of it gets turned into curcumin glucorinide and curcumin sulfate, neither of which are bioactive, and into the small intestine by encapsulating the fine curcumin powder in an enteric coated capsule that can resist the stomach acids, but will dissolve in the alkaline environment of the small intestine, releasing its contents, which promptly dissolve in that environment and enter the vein system in molecular form. Some may still get lost through conjugation into glucorinide and sulfate, but more will at least get dissolved and able to enter the blood stream because it wasn’t conjugated while in the stomach.Second idea is to dissolve the curcumin into some kind of fat (how about cocoa butter?) that is hard at room temperature, like chocolate, and form it into a capsule form, which gets swallowed whole. As it makes it way through the stomach it slowly melts and the fat breaks into droplets with the curcumin still dissolved in them. These droplets are then emulsified in the small intestine and go on their way into the lymph system to be digested by the lipase, as in the above description. The main advantage of this approach is convenience. Just pop a few delicious chocolate-flavored lozenges into your mouth and swallow them WHOLE, and your curcumin is on its way to lymph heaven. I particularly liked his second idea: chocolate, my favourite thing in the world, AND curcumin? I must do some experimenting. And why not mix curcumin with a ganache, i.e., warm cream with unsweetened dark chocolate? Ahhh, the possibilities are endless. September 30 2007 post. Two interesting comments to yesterday’s post. First, I would like to address Don’s comment. With my almost non-existent scientific background, I think the idea of swallowing the chocolate lozenge just as you would swallow a pill is in order for it to melt slowly not in the mouth but in the stomach. If it melts in the mouth, wouldn’t that defeat the purpose? How would curcumin bypass the stomach if it were not still encapsulated in fat? I could be totally wrong, of course.Second, Marcelo’s comment. I agree, I would love to have a chemist comment on all of this, too! At any rate, his wife now dissolves curcumin in olive oil. A possible suggestion to improve taste would be to add herbs and spices to this concoction. In the past, I tried flaxseed oil, but the taste was so dreadful that after a couple of weeks I became nauseous just at the sight of this mixture, no matter how much I tried to think of it as a Harry Potter potion. However, I still think an oil mixture is a good way to take curcumin (and Biocurcumax would be proof of that, although where to get our hands on essential oil of turmeric is beyond me), perhaps THE best way, but you have to have a strong stomach for it. By the way, if you would like to read the Biocurcumax patent application, go to: http://tinyurl.com/2nqcjf I will go through this application more carefully soon.As for milk cream (would that just be cream, Marcelo, as in whipping cream or double cream? ), I would suggest heating it. It seems strange that your curcumin didn’t dissolve in cream. In the past, I tried the warm cream/curcumin (another yuck!) mixture, and the former dissolved rather easily. There may not be enough fat content in your milk cream. (? )A good question would be: how to make all these great concoctions more palatable? I am very open to suggestions.Here are a couple of things that I would like to try in the future. One is the chocolate lozenge idea; the other is the oil idea, with, as I mentioned previously, the addition of other spices (spices have anti-inflammatory effects, generally speaking, so I very much doubt that they would interact negatively with curcumin) in order to make the concoction more palatable. Speaking of palatable, I remember that last year, after preparing a huge Indian feast, I took my curcumin mixed in the oily part of the food, and it tasted absolutely fantastic. I couldn’t taste the curcumin at all when mixed with all those wonderful spices. Well, in my September 12th post ( Signaling Protein for Multiple Myeloma Identified ), I wrote about an Indian dish called Vindaloo. Given my previously-described successful (in terms of taste, anyway!) experiment with curcumin and spicy oil, this reinforced my idea of mixing curcumin with the warmed up oily part of this dish. That might well be the best way to take curcumin. Ahhh, with spices there really are so many different possibilities. I wish I could do one experiment for two weeks, have blood tests done, then do another experiment for two weeks, and so on. But patience is a virtue, no? And in fact, according to an Italian proverb, la pazienza ÃƒÂ¨ la virtÃƒÂ¹ dei forti, which roughly means patience is the virtue of strong people. So I will be patient, I will be strong, and try one thing at a time, for two months at a time. October 1 2007 post. Last week I stopped taking the Doctor’s Best curcumin capsules, fearing a possible interference between the bioperine and my massive daily dose of antibiotics (I am not sure that that would be the case, but better safe than sorry!). Since I don’t want to stop taking curcumin for obvious reasons, though, I figured that now would be a good time to try one of the new increased bioavailability ideas.Since I am not up to making chocolate candies yet, I decided to try my chocolate ganache idea. All I have in my kitchen right now is some 70% dark chocolate, which yesterday afternoon I melted over low heat, adding a small amount of organic butter, then some whole organic milk. I mixed about two grams of curcumin powder into this thick dark liquid and drank it. Now, keeping in mind that right at the moment I have quite a head cold and my taste buds are, consequently, a bit altered, this mixture tasted just fine to me. Quite an interesting color, too. This morning I upped the dose of curcumin to four grams. The taste was definitely worse but not horrendous. Once I get my hands on some double cream and some cocoa butter (which has a 50-57% fat content), I won’t need to use butter to increase the fat content of my fake ganache. Still, even without the cocoa butter etc., I can confirm that curcumin will dissolve easily in what is essentially warm (almost hot) chocolate milk, without sugar. Whether it works on my myeloma markers well, I won’t know that until I have my next set of tests. My experiment continues. October 2 2007 post. Today I thought I would gather together a few more of my blog reader suggestions (if I have forgotten anyone, please let me know! ), and also show a few photos documenting how I am currently taking curcumin (see explanation below). The curcumin powder here depicted (see photo on the left) is the C3 Complex curcumin, without bioperine, that I order from the Italian distributor for the Sabinsa Corporation. I keep it in a hermetically sealed ceramic jar so no air and light will make it deteriorate. A blog reader with a plasmacytoma (diagnosed three years ago) is currently stable. He takes curcumin together with a product called Barley Green, which, from what I gathered on Internet, is composed mainly of organic barley grass containing active enzymes, minerals, B-vitamins, amino acids, essential fatty acids, carotenoids, bioflavonoids, and chlorophyll. This mix allegedly gives a boost to the immune system and reduces inflammation. I have never tried it, but I HAVE been curious to try wheatgrass, which is not readily available here in Italy, though. I love what this blog reader says about myeloma cells, i.e., that they don’t like green. When I visualize, I focus sometimes on things that my myeloma cells don’t like, and it makes sense that they don’t care for healthful diets full of green veggies. So this is interesting. Does anybody else here take a similar green product?Another blog reader suggests letting curcumin rest in the flaxseed or liquid preparation for about a half hour before drinking it in order to give it time to go through and finish its chemical processes. This is analogous, I suppose, to letting fresh homemade pasta dough rest before rolling it out. An interesting idea. The only thing that would concern me is that curcumin is not happy when exposed to air and light. But perhaps mixed in a liquid would lessen its chances of losing any of its healthful properties. Any thoughts on this? Blog reader number three dissolves curcumin powder in very warm milk and then adds the omega 3 oil from a capsule (Omega 3-6-9 lemon flavor from Nordic Natural). She says this makes it very palatable. When she mixed it with coconut milk (as yours truly used to do), she did not like it (neither did I). It was the smell from the milk what make her sick (no kidding! Me, too!). Sometimes she adds coconut oil to her concoction, which tastes very good, too, she reports. A fourth blog reader does the following: I mix the caps of curcumin in a teaspoon or two of organic flax seed oil – it dissolves easily. Then I add about 1/3 cup of organic fruit yoghurt and stir it up. Next I add a 1/4 to 1/2 cup of frozen raspberries (or other small frozen fruit). Stirring this turns it into a kind of frozen yoghurt ice cream which doesn’t taste wonderful but is palatable due to the fruit flavour and the cold (which reduces the flavour). This is also an interesting method. I tried mixing curcumin powder in organic fruit yoghurt in the winter of 2006, between November and January 2007, and my IgG numbers didn’t decline at all. I just checked, though, and my monoclonal component did indeed decrease, which is important. So, that method might work after all, even though there is no heat involved (remember the abstract on increasing the bioavailability of curcumin by heating it up?). At any rate, in January 2007 I switched to curcumin capsules with bioperine, and my subsequent tests showed a decline in my IgG count, the first decline since November 2006, but also a slight increase in the monoclonal component. Sigh, this is SO hard to figure out. Here are three not-so-great photos documenting my now daily chocolate curcumin preparation (two preparations/day). The photo at the top shows a full teaspoonful of curcumin, about four grams; the second photo shows four grams of curcumin powder sprinkled over the warm, almost hot, chocolate, butter and milk mixture, and the third shows what I actually drink, which is lighter in colour compared to the mixture in photo 2, obviously. The taste is not bad at all. And this is also not a bad way to get my chocolate hit for the day! The starting point to understanding the central issue of low bioavailability is to realize that curcumin is insoluble in water at pH of 7 and below. Therefore, in the stomach, where the curcumin first encounters body fluids, it remains insoluble because the stomach fluids are acidic. Once the stomach contents enter the small intestine they are changed to alkaline pH by the bile and other digestive fluids that are injected there. Curcumin is soluble in alkaline aqueous solutions at a pH of 7.4 and above and would dissolve in the small intestine. Then the curcumin molecules that are present only when a solution exists can enter the capillaries of the hepatic venous system that serves the stomach and the large and small intestines. Prior to solution, curcumin exists as small crystals or clumps of crystals that cannot pass through the tiny pores in the capillary walls â‚¬”only molecules of curcumin can â‚¬”thus the importance of having the curcumin in solution. However, it is found that in the stomach the curcumin is rapidly conjugated to curcumin glucoronide and curcumin sulfate, neither of which show any biological activity with the cells, as does curcumin. As a result, a considerably smaller part of the total ingested curcumin enters the small intestine, ready to be dissolved there. But some does dissolve and gets through the venous capillaries and then proceeds through the hepatic portal vein directly to the liver, where it undergoes first pass metabolism wherein more of the curcumin is converted to biologically inactive metabolites. All these hurdles must be surmounted before the curcumin gets a chance to circulate to the rest of the body to organs that might use it beneficially. The end result is that the measurable level of curcumin in the blood serum peaks very soon after a small two mg dose is given and only reaches a very low peak concentration. November 29 update, please read November 25 and 26 2007 posts on a new bioavailability study and the following: about a month after I wrote my most recent update (October 28, that is), I have changed my mind about dosage timing. It all began when a friend told me that she decided to take her dose of curcumin all at once, yes, all eight grams, in the late afternoon because that is when she felt most relaxed. Soon thereafter I found out about and wrote a post on circadian rhythms. An eye-opener. As a result, I now take my curcumin powder (mixed with melted cocoa mass and a bit of honey) all at once just before going to bed, when my enzymes, I hope!, are not as active as they are during the day. My idea is that if my body is not so active perhaps curcumin has a better chance of being absorbed. Not sure how scientific this is, but as soon as I can ask someone with the proper scientific know-how, I will report the answer. Taking curcumin in one big evening dose is a big change for me, but it makes my life easier especially on the days when I teach. Of course, matters would be different if I took curcumin capsules with bioperine. In that case, I would divide the doses into two, mainly because I really hate to take so many capsules. For now, I am sticking to the cocoa mass concoction. I have been using hot milk or yougart besides half a teaspoon of black pepper for better absorption. Recently have started taking Omega 3 capsules three times a day. There is a company that makes Longvida curcumin in the US. They claim it is covered in Lipo fat; therefore has 65 times better absorption. If it is true then what should be the dose for something like that. If someone has a comment please submit it. Dr. T Campbell study shows that animal fat and that includes dairy is cancer causing. So the question is if we use milk everytime (4 times daily) then that might be offsetting the anti cancer effort. The Longvida curcumin was referenced in a study by the Natl Institute of Health as being the highest in bioavailability. Hi Margaret, I’m Fausto (from Milan). If you haven’t read it yet, really go and buy a book written by dr. David Servan-Schreiber. He’s a French-Canadian doctor who wrote a very simple (but really informative) autobiographic book on cancer. The title is “Anticancer” (in Italian: “Anticancro” published in Italian by Sperling & Kupfler). Inside it you’ll find, among other interesting tips, good literature/indications on curcumin bioavailability. I know your comment is dated 2010, but just wanted to let you know that Dr. Béliveau was interviewed on this subject, yesterday, on our French radio station. In Moncton, NB, Canada. Most interesting, I must say….also there is a Dr. William LaValley who practises in Texas, and in Chester, Nova Scotia, who is being interviewed by a Joseph Mercola on the subject of curcuma, on you tube. Quite interesting! Ciao Fausto, in fact, I have some of Dr. Béliveau’s books, including an anticancer cookbook. Very useful, I agree. I remember reading somewhere that simply adding black pepper to curcumin won’t do much. What you need is the black pepper extract (=piperine or bioperine). The other thing is that you would have to take a truckload of turmeric to get enough curcumin to make a difference. Turmeric, in fact, has a very low content of curcumin: 8-9% at the most. I take C3 Complex curcumin capsules (with piperine): 8 grams per day. I am used to taking this amount…It’s not a big deal anymore. But you are right: here in Italy curcumin is quite expensive. I buy mine in the U.S. and bring or have it brought over here. I have a one-year supply by now. My best wishes to you, too. Are you taking the equivalent of 20 capsules a day? At 400 mg per cap that’s what it appears to be. The Longvida product does not contain animal products according to their web site. It appears to be a phospholipid enacapsulation – not sure if its at ‘nano’ size or not. but the science looks promising. be aware that a 500mg capsule has 100mg curcumin. 500mg curcumin per day would be 5 capsules. Also remember that the absorption is supposedly MUCH higher to target tissues. Curcumin and chemotherapy can be a good or bad depending on chemo type. My simplistic research indicates Taxol is potentially synergistic. A study indicated reduced effectiveness of Cyclophosphamide. So do some research if considering use with chemo. Hi, i would like to know if soya lecithin (organic)…will be as good as milk….??? ?.i think there is enough “fat” or oil in it to blender with curcumin……what do you think?.. Margaret: Have not been able to locate one single Enterically Coated Curcumin tab/cap/ anywhere. Do you have data on the avilability of Ent.Coatd.Curcumin? Brand? Etc? I have a rare cancer called pancreatic neuroendocrine carcinoma. I’m a big fan of curcumin and have read your blogs with great interest. On the subject of bioavailability of curcumin, I recently read of some research in which an extract of chinese sweet tea (the active ingredient being rubusoside)was used to dramatically increase the sulubility of curcumin. Have you heard of this and if so are you or any of your readers using this? I am also looking for enteric coated curcumin for my teenage daughter – it has been reported to be effective in the treatment of the auto-inflammatory syndrome TRAPS (TNF receptor associated periodic syndrome ). Please – if someone has this info provide a source! @ Jeanne – maybe here? as prostate patient now receiving an intermittent hormontherapy I am interested to find out, whether a version of (nano-) curcumin-capsule is known that enables and maintains bioavailability of curcumin for a significant time in a sufficient concentration so that three to four capsules per day may produce potential benefit of curcumin. Should your time permit, it would be very helpful if you could answer the above question. When I tried to open the Consumer Lab 2011 report,I found your link blocked. I got around it by opening the casch ( spelling ) link. Looks like they are unhappy with you ? I had to register and pay $12.00 to get the report. I have a Kangen machine that raises the alkilinity of drinking water to 9.0. Would that be helpful in dissolving the curcumin? Keep up the excellent piece of work, I read few posts on this site and I conceive that your blog is really interesting and contains lots of superb information. I recently read a patent submission that states Meriva’s -a PC Phytosome- Bioavaiability is substantlialy further enhaced with Piperine. In addition, there is research being done at this time to see if chronic amounts of piperine (over 5mg/day) could be toxic or damaging to the liver or other organs, and affects testosterone levels adversely. Also all medications are regulated by the liver, and bioperine interferes with this process. After being diagnosed with prostate cancer, I also experimented with many curcumin products and mixes. I got my best results from curcumin 95% from http://www.turmeric-curcumin.com and mint flavored cod liver oil from Swanson Health Products. Wondering if anyone has tried the bcm-95?? Your comments on curcumin plus cod liver oil caught my eye since I also have prostate cancer. I would like to talk further about this. My enail address is tom28950@yahoo.com. Could I ask you for to send me a note so I can follow up with you? I am curious by what you mean by “best results” when using these two products. Michael, if you look carefully at the graph you posted, it is for curcumin delivered via IV. There is another chart on the same site showing that a significant difference WAS found in humans when delivered orally. I was recently diagnosed with CLL. My white cell count has been rising steadily and I would like to begin taking curcumin supplements to see if that can help keep my counts from going higher or even lower them. What brand or company do you recommend? Is it better to get organic tumeric and mix with coconut milk? Thaks for your help! I would like to see some discussion on dosage of curcumin concerning having a more steady serum level with a product like Meriva-SR taken twice a day versus a large dose of a C3 product taken all at one time. This provides simple examples and calculations to follow. I found it while researching Pterostilbene –similar to Resveratrol. I mix curcumin (10g), lecithin (one full teaspoon)+Vitamin C (250mg) and D (1000 IU), fish and sunflower oil (one full teaspoon 1:1),black pepper ( 1/4 teaspoon) and than heat it up (80-90 C) for 2-3min. Take 1/2 teaspoon every hour or so. Good luck, hope this helps in some way. Curcumin is classified as a vegetable dye (yellow). It will stain a countertop in seconds. Anyone tried the “Biomor” brand of curcumin? They say the bio-availability of their product is vastly superior to other curcumin products. the study below utilizes Curcumin with Piperine and Quercetin and provides the rationale for doing so. Just to advise that all the information on http://www.grouppekurosawa.com has been removed by the author’s sister, following the Author’s (Stephen Martin Phd) death. This is wrong in my view, but the author;s sister believes that the information is “out of date”. Also, one more important observation which is not possible to explain scientifically, and most probably factors into your sustained good health, is your exceptional upbeat positive attitude about enjoying life–these is more powerful than 8g of curucmin for sure! Thanks again! I did lots of research on curcumin for a couple of years now. The most recent update to bio-availability is a product called longvita, used in some recent supplements. But I found a liposomal powder that is great. I have a friend with HPV and she has the cancer strain. She started using this new liposomal form as the piperine was totally taring up her stomach. After 3 months on it she has got her 1st clear pap smear in 5 years. Yea it working. The Product is call Curcumin & PC. It is made by a company called Nutrasal. Not bad tasting, but not great. I hold it in my mouth before swallowing. The liposomal’s take supplements to a whole new level. I am currently using 4 liposomal products because I have leaky gut. Wish I could get all liposomals. Hope this will help. Oh, on side point and If I can find the research article again I will post the link. But curcumin also cleans the liver of fatty deposit, and keeps bile ducts clear. Good luck to all and a healthy New Year! Has anyone else transitioned from the c3 to this stuff in the powder form for mgus or myeloma? Margaret, what do you think? And since you had bad results with the biocuru 95, is it similar to this? After speaking with longvida and nutrasal, I’m a bit concerned as the lack of info I’ve received from Dr. Aggarwal in regards to these products and their application and difference from either Meriva, or C3 curcumin–he wrote,”it’s like comparing apples to oranges”..honestly, I have no idea how to interpret that. I’m just trying to find out my best option for avoiding the bioperine, and taking the AFI no biop in yogurt is just so gross, and trying it in milk today, was grosser! If I need to do this at higher doses and basically for a very very long time..I need something that’s going to be workable…can anyone out there help me out a bit–on these differences–and which one is best–thank you!!! Longvida told me they have oncologists giving it to their myeloma patients at 3-6g doses a day. Do those of you who are taking bioperine realize that it has calcium in it? If sabinsa has the patent for bioperine as it appears they do, and this is from afi website–then these are the ingredients of bioperine…can anyone please comment on this? When I asked AFI when I ordered, they said that is why they make the plain curuminoids which I started taking because many people don’t want the bioperine in it….. I was thinking, the melting point of curcumin is around 180 degrees C, so would it not have to get to that temperature in oil to dissolve? Melting and dissolution are not the same. Hi, just wanted to chime in here with a tasty recipe for ingesting circumin. If you dissolve your dose in a little bit of olive oil with pepper and then mix with tomato juice the concoction tastes just like tomato juice. If you microwave for 15 seconds the two mix even better together. @Rob – Glad you chimed in, Rob. I agree; I’ve been using the Vitamin Shoppe’s Curcumin with bioperine and I put it in a very small amount of bloody mary mix; it’s delicious. I’ve tasted the curcumin without anything though and it has no taste, so it’s no surprise that it doesn’t change the taste of tomato juice or bloody mary mix. For those interested in good oils, Barleans orange-flavored fish oil liquid is very good; I take a tblsp a day and highly recommend it. anyone familiar with physician naturals which appears to have the c3 powder or ageless cures..i just ordered from ageless cures–and they will be getting the powder in also. Can you give your opinion on Doctor’s Best, Curcumin Phytosome Featuring Meriva, 500 mg. This is meant to have the best bioavailability. Can you help me choose the best curcumin from Phscians Natural. I have arthritis/tendonitis, BPH, colitis. What do you think? There are a few liposomal curcumins out there as well now. Not sure if you are still looking at your blog but I have tried for hours to try and find out the difference between C3 and say tumeric-curcumin.com’s product. The later is cheaper but seems to be 95% etc. Can someone enlighten me? I would like to ask Margaret or others who use her method of taking their curcurim. Melting chocolate and adding the curcurim for better bioavailability. How do you follow this regimen when away from home or traveling? I Think you’re on the right track.! I always look to the traditional ways it is taken and these methods often hold true when you dissect them using modern scientific logic. In India they use ghee to prepare it, which involves fat and heat. Subsequently the ghee-turmeric is mixed with warm milk and take in this way, which also provides the water soluble component. I am looking out for fresh turmeric in the stores soon to prepare it in this way. I have been researching curcumin. And as best as I can figure you are doing absolutely right to take it with bioperine and fish oil. Hi i have read my brain into total confusion about curcumin/turmeric and how it is brillient at getting rid of cancer. I have breast cancer and secondary in the bones. I hate the smell of curries and make me feel very ill indeed. I have found turmeric in holland and barrett and i am wondering if these will solve my dislike for spice inside. Also has anyone tried them? turmeric has a miniscule amount of curcumin in it, not enough for a therapeutic dose unless you consumed an impossible amount, but on the other hand it has OTHER beneficial components. If you are taking curcumin for therapuetic reasons (cancer, arthritis, etc) you would do better with dedicated curcumin capsules than turmeric/powder/cooking, if I understand this correctly. You will not taste anything. Sorry if the link is not active but you can copy and paste to get there if you are interested. Be warned this stuff does stain just about anything it comes in contact with. My wife read the riot act to me when I got a little in the white porcelain sink in our kitchen. Fortunately good old bleach in some standing water in the sink removed the stain completely in minutes. Now that I have breakfast figured out for absorbing curcumin I just have to come up with additional methods of ingesting it throughout the day to achieve that overlap mentioned much farther up in the blog. Thank you for the very helpfull information. Could you mind to give me the contact of Sabinsa corp? I want to buy curcumin c3 by sabinsa, for my mom. She has reccurance pancreatic cancer stage 1 b. She got whipple surgery 2 years ago in Johns Hopkins Hospital, and the latest chemoradiation in may 2013. Now I want to give her the best curcumin recommended. I take with fish oil. Does anyone know of a comparison of curcumin supplements for purity and total curcumin content done by the government or an independant lab? There are so many products and claims! Dear Margaret , first I’d like to thank you for all of your time & dedication in sharing this valuable information.!. I’ve recently diagnosed with a terminal illness. I have been depressed & of course it’s getting worse. Thank you so much for your positive attitude. It’s given me the wake up call I needed. I do think being in a positive mindset is number 1 after being told you’ve got an incurable illness. You’re an inspiration to me & I’m sure many countless others. That’s all I want to say. You’re a great inspiration. I want to provide my positive experience with tumeric. I don’t know about all of the scientific studies of bioavailability, ph and fat requirements etc….and much of which I rarely trust anyways because so many researchers have a monetary agenda or perform studys in a manner that is full of errors leading to incorrect outcomes. I am only 49 years old and up until recently in great heath. This last year I started suffering with inflamation that kept moving throughout my body, as well as many other ailments, but no diagnosed disease. The inflamation in my back has become painful. I recently started juicing fresh organic vegetables daily and have seen an improvement in my health. I found fresh tumeric being sold at my market so through that into my juicer on day along with the other vegetables (I usually juice about 8 -10 vegetables every morning to get an assortment of green leafy vegetables, cruciferous, sulfur, and bright colored veggies. I don’t juice fruit except lemons, limes and occassionally an apple). After drinking the juice with tumeric it occurred to me that my back pain was gone. As the day went on the pain came back so I juiced again using tumeric and the back pain and other inflamation diminished without any medications which I hate to take. I discovered this totally by accident. So now I control my daily pain and inflamation by juicing tumeric along with my other vegetables. I include no fat, no heat, etc….so I know it works and gets absorbed into my system regardless of the so called low bioavailability! Now I have to note, when I use powdered organic tumeric spice it does nothing – no results. I am not a fan of supplements because I believe if they REALLY worked I would see results. But they are not the same as getting nutrients in the complete form in the food we eat. If I take a supplement I feel nothing. When I juice my vegetables daily I can start feeling them almost immediately like create energy in my body and head. Sounds crazy but its true and I can see it immediately that day in my skin inflamation issues, etc….. Most studies are done with the powders. Try the real tumeric! Now I peel tumeric and eat it as well as juice it and I know it is working because I am living proof!! Very interesting Michelle. I’ll have a try. I don’t know if anyone can help me. I have been suffering for a year and a half with the severest case of post herpetic neuralgia on my buttocks. The redness and pain is unbearable , morphine, and fentanyl nothing helped , until I tried Drs Best curcrurin c3 complex which is the sabinesa ingredients and used by md Anderson. After working my way up to 5 gm. a day the redness and pain was down from a 10 plus to about a 2. I had a stomach virus andmissed 4 doses of it 2 months ago and within 2 hours, the inflammation returned and redness worse then ever. I IMMEDIATELY THE NEXT DAY STARTED BACK ON THE CURcurmin. im up to 8 grams a day and the pain is still horrendous. Have you heard of this happening, what else can I do to make it work better again. Im aftraid to totally stop it altogether for fear the pain would wind me up in the hospital. its unbearable now , and stopping it may make the shingles come out. My problem is they never erupted instead erupted under my skin , this was after several steroid injections for my sciatica, they think the steroids lowered my immune system and gave me the shingles. Ive emailed Dr. aggarwal, a wonderful man a few times, but now either he is out of the country or very busy and I emailed but have not gotten a response. I live in NY . If there is a homeopathic doctor who can help me and my post herpetic neuralgia or if anyone has had curcurmin stop like this please loet me know. Thank you and bless you for this blog. I hope you are in good health. according to professor bharat aggarwal and his video on curcurmin and bioavailability. just a few sprinkled of black pepper makes the curcurmin work 200% in the bloodstream. Drank it and never new there was any curcumin in the solution or mixture. After I have read your article some things started making sense. From kundalini yoga I know a recipe called golden milk https://www.3ho.org/3ho-lifestyle/yogic-diet/solstice-diet/golden-milk-healing-beauty-tonic-vitality-and-flexibility. You have to boil small amount of water with tumeric powder for 8 minutes, then mix it with warm milk and add some raw almond oil. The main teacher of kundalini yoga yogi Bhajan said that cooking tumeric for 8 minutes is very important, but I could not find any scientific evidence for it until now. Also, he did not say why it has to be consumed with milk and almond oil, so now it makes much more sense. Thank you so much for your extensive research and posting all this valuable information! I happen to just started cooking with Organic Tumeric directly in my food. I suffer with Lupus SLE/Severe joint inflammation and Fibromyalgia. Everyday I make a dish with Quinoa/kale/ can tuna (in oil), chopped, red onions, a nice dash of black pepper and cayenne and tablespoon of olive oil and half teaspoon of Tumeric. There are many recipes from India and South East Asia in which Tumeric can be indigested daily without the trouble. I believe the key is keeping an olive oil and pepper (which is known to speed up the immune system) and enjoy the Tumeric as a part of your daily life instead of treating like it’s a bad spoon of medicine”. I just started this regimen and I am going to find a book on Amazon with recipes for Tumeric, so as long as I can add an oil (fat) and pepper, which I know for Indian and South East Asian dishes, should not be a problem. I also am eating a lot of Curry which has curcummin and Tumeric combined. I notice many people from Asia and South East Asia have lower cancer rates. This could primarily be because of the use of Tumeric and veg/animal fat, Coconut (oil) and the use of peppers in their diets. After reading so many post on this thread, I want to encourage everyone to treat Tumeric/Curcummin as a daily part of your life and not somekind of “bad spoon of medicine”. It’s an enjoyable form of spice of life….I will start to post more once I start seeing some health effects. WISHE ME LUCK as I do you all! I’m using CuraMed which contains turmeric essential oil it’s proprietary blend. I was using Doctor’s Best before switching to CuraMed. Also, I am using Sacred Frankincense oil topically on my dad’s breast cancer tumor and it reduced in size after the first week (we were shocked). I mixed the Sacred Frankincense oil with Jojoba oil (a carrier oil) and apply it twice daily. Sacred Frankincense essential oil can be purchased for internal use as well and my whole family is taking it orally. The downside is that the oil is expensive (to me). I found the best price at a site called Aura Cacia Essential Oils. I have also recently discovered fulvic acid. If anyone is using it, please let me know your thoughts. Thank you to everyone for the great information. I am interested in purchasing curcumin supplements highest in bioavailablity for purposes of preventing cancer and Alzheimer’s disease. I had it down to meriva form, longvida and BCM95. The more I read, the more confused I am as to which one to purchase. My late husband died of cancer; therefore health and nutrition have become my strongest interest and have become holistic. I have been told that the spice versus supplements are not medicinal. Your advice is much appreciated. My dad had recently a colon cancer surgery. He is just stage 1, so I guess he was lucky. But he also have some old problems with his liver and also have diabetes type2. What type of curcumin do you think it will work best for him? Thank you all in advance and special thanks to Margaret with her awesome blog! Very nice ideas on curcumin absorption. After a relatively exhaustive literature search, I was amazed I couldn’t find any published studies on curcumin absorption when taken with fat or a fatty meal. The impressive studies comparing curcumin absorption using Longvida and BCM95 were done on an empty stomach. 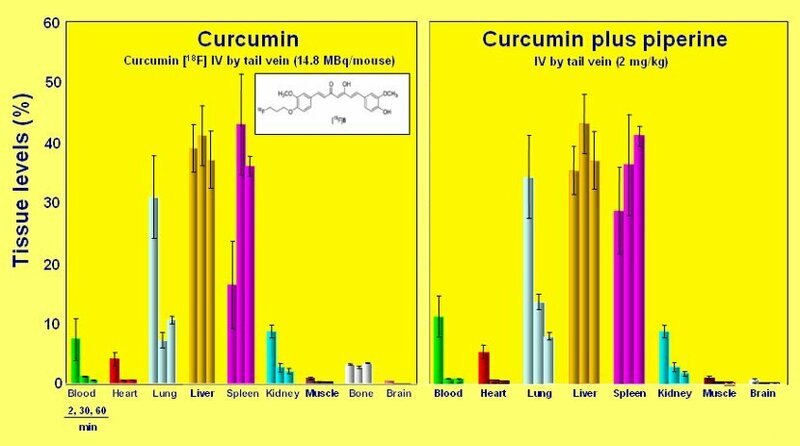 Therefore, the generic curcumin did not have the advantage of fat while the Longvida and BCM95 are both made with fat included (Longvida in micelles and BCM 95 mixed with turmeric oils). If you want to promote a fat soluble product for its bioavailability, just combine your brand with fat and test it against the plain compound on an empty stomach. The plain compound will not be absorbed and your (fat included) product will demonstrate infinitely greater absorption. This was done in the nineties for CoQ10. A product called Q-gel (CoQ10 encapsulated in oil) was flying off the shelves because they published an absorption study comparing it to powdered CoQ10 on an empty stomach. In my practice we use powdered CoQ10 but take it with food (fat). Our patient’s blood levels of CoQ10 are terrific and in fact, significantly higher than they were on a CoQ10 encapsulated with oil. Unfortunately, there is no commercial blood test for curcumin levels and no other biomarker to easily measure its absorption. I strongly suspect that curcumin is well absorbed when consumed with fat but cannot be certain. This is unfortunate and I hope soon, that some PhD (real doctor) will do a simple clinical study to determine it once and for all. If curcumin is well absorbed when consumed with fat … would this also apply to the Meriva version of curcumin? Thank you for your comprehensive blog. I have recently discovered Curcumin and it’s health benefits. 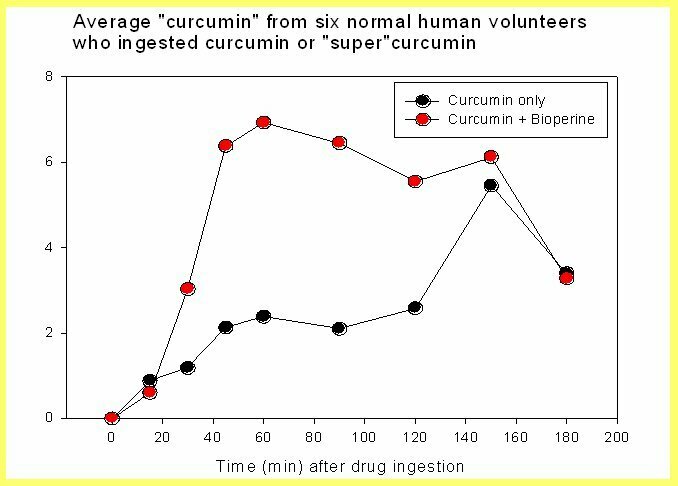 I have chosen the Solgar Curcumin that is claimed to be 185 x more bioavailable due to their encasement of curcurim in micelles. I am taking the capsule with food that is prepared with fat ( either olive oil, ghee, grapeseed oil or coconut oil). Will report back after 1 month of taking the Solgar Curcumin. Wishing you success in your pursuit of health. Interesting debate about bioavailability and curcumin and quite recent i noticed. I have been looking into this as after 5 years of curcumin keeping my paraprotein stable it is all of a sudden going up. Something must havxe prevented its absorption for the last 2.5 months. I discovered that there has a lot of research been done on the bio availability and how the curcumin absorbs best. I still use drs best c3 curcumin with peperine 1000mg – 8 grammes a day at once on an empty stomach – following aggarwals protocol. Reading up on it i found that the latest s nano curcumin that seems to absorb even better. Has anyone taken that and what are the rsults? Following on from my earlier comment, someone told me about Theracumin and its effectiveness and that it helped reduce the paraprotein by a third in 6 months. I wanted to email Aggarwal to ask him about it but he now seems to have left the Anderson Institute at end 2015 and can’t find how to contact him. Does anyone know how to contact him? It appears that Dr. Aggarwal has moved to San Diego where he founded a new research institute. thanks for sharing all of this with us. I want to add how I take my daily 4 grams: I am taking tham together with a “Budwig cream” (flaxseed oil and cottage cheese). Besides taking the caplets (product Bioperin C3 complex) directly, I tried as well crushing them to a powder and then mixing the power with the flaxseed oil before I apply the cottage cheese. One level up is to heat the oil and the curcumin (I do that in a microwave oven). Both techniques result in a very bright yellow cream, the heated variant is brighter. High heat will kill the turmeric rendering it ineffective. I’d research that further before adopting that method. It is very interesting how this post still comes up in the search engines under your website. It is a debate that doesn’t seem to go away so easy. Just to add to the many comments over the years, but I recently read that lukewarm water helps the pills to dissolve and apple cider vinegar helps absorption. Interesting as I am already taking a spoonful of apple cider vinegar with honey in warm water in the morning because of its health effects. After I have had my blood test done I am thinking of maybe starting to take the 8gms curcumin which I take all at once in the evening with warm water and cider vinegar instead. I’ve read on this blog that taking it with olive oil and pepper help with absorption. I bought the longvida curcumin by nutrivene which is specially formalized to break down in your system better than regular curcumin. However, I bought the powder as I don’t like swallowing pills and was unsure about how I was going to take it. I decided that I would use olive oil and pine nut hummus and mix the curcumin in with that and use cracked pepper pretzel chips to take it. When you mix the hummus with the curcumin you can’t taste it at all! It’s actually delicious and you get the olive oil and pepper all-in-one. I would recommend this method of taking the powder. I am currently having an inflammatory issue with an ear nerve inflammation and am trying the curcumin as an alternative to steroids since I can’t keep taking them for long periods of time. Hopefully this helps! Black pepper loses it’s properties within 20 minutes of grinding, so the black pepper chips aren’t assisting the bioavailability of the curcumin. I buy the powder, put it in the Ninja with 1/2 banana, 1 kiwi, 4 oz almond milk, and 4 oz orange juice then right before I blend it I give the pepper grinder 2-3 turns. Blend and drink. Delicious! Robin, that actually sounds delicious. Where do you buy the POWDER? And how many mg. do you take? Also check out ‘anti fungal treatment’, as that has cleared up blood cancer..(separate story) google anti fungal and leukaemia and you might fined it..it is also associated with gut bacteria, candida, etc it is all on the utube by Natasha McBride and Dr Mercola..
And this all produces the inflammation which is what the curcumin and green tea, uses the same pathway to eliminate…also google that pathway for both green tea and curcumin. I don’t have info on me right now, in the library..